All you need is a dice, deck of cards, and/or colored Jenga, and your students will enjoy 128 task cards (and growing!) 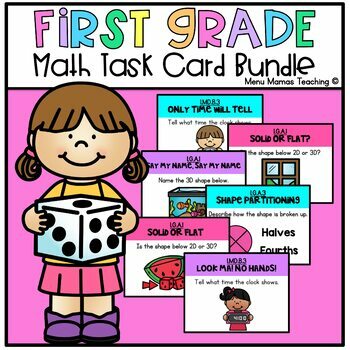 for hands-on math games! Detailed teacher and student directions included! This is a fully-interactive, no prep product that is differentiated by DOK math levels and color-coded to meet the needs of all your student mathematicians! Please note that this is a growing bundle, which means that not all the files are currently available for download. If you purchase this bundle now, you will receive all of the current files and all future files added at the discount price you purchased, simply by redownloading the file. All additional files will be yours at no additional cost.